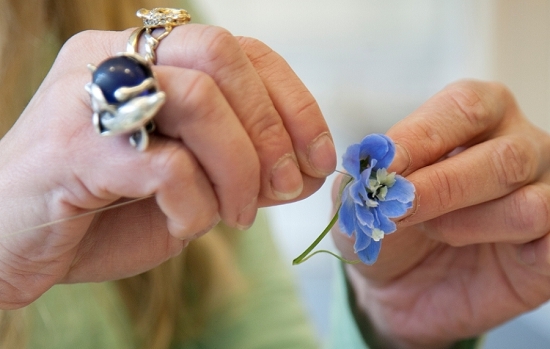 On Day Two of British Flowers Week: Discover all about Rebel Rebel's favourite British summer flower, the delphinium! 'Delphinium' comes from the word 'dolphin'. Why, you may ask? Because the ancient Greeks felt that the hollow pocket of each flower with a spur on its end resembled a dolphin. Most modern delphinium varieties are hybrids or cultivars of delphinium elatum which originated in the Alps. Various plant breeders are credited with the varieties that you see in British gardens and with British cut flower growers today. Victor Lemoine, a prodigious French plant breeder working at the turn of the 19th century was one, and 70 times Chelsea Gold medallists, Blackmore & Langdon, specialist delphinium growers and breeders are another. 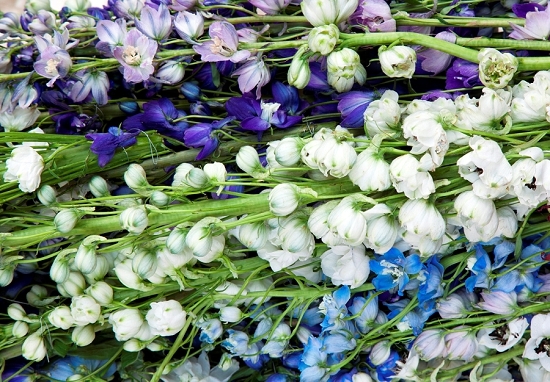 British-grown delphiniums are available in a stunning range of colours from rich, deep blue to soft, baby blue, hot pinks, blush pinks, pure white and decorated with stunning markings. A spectacular variety, white with black, dappled centres, is being snapped up by excited buyers in the Flower Market at the moment. Grown in Spalding, it is being sold by Pratley. Delphiniums are surprisingly versatile. Florists use them in vast urn arrangements, in hand-ties and the individual flower heads for more intricate work. 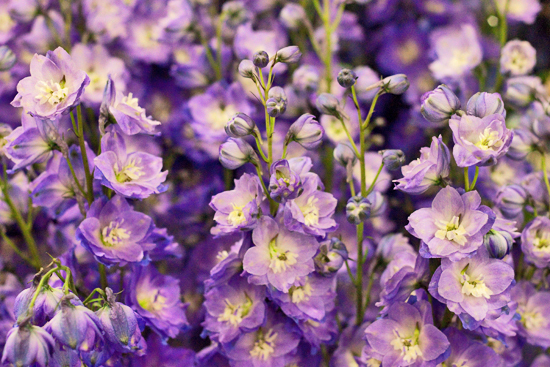 Rebel Rebel chose British-grown delphiniums as their favourite flower for British Flower Week. See how they were inspired to work with this most majestic of British flowers here. Delphiniums are desperately thirsty flowers. They drink a lot of water, and if they dry out, they are gone. "All the hollow stems are filled with water. They put their thumb over the end of each one and lower them into a vase full of water. The stems last well, with the individual flowers even at the tip of the spike lasting at least a week." Does it work for you? And don't forget to take care when handling delphiniums: every part of the plant is poisonous and can cause skin irritation and stomach troubles. Not so pleasant. The peak season for British-grown delphiniums is from mid-May to the end of August. During this period, they generally come into the Flower Market fresh from the growers for Monday and Thursday morning trading.